When you think of Jimmy Buffett in the 1970s, where do you picture him? Key West may be the first place that comes to mind for most people. Road tripping with Jerry Jeff Walker on his first trip down A1A? Maybe you envision him on Bourbon Street trying to make a living in the Crescent City. Nashville at Billboard Magazine? Atlanta at the Fox Theater? Maybe you see him on a sailboat in the Caribbean. All of these places would be logical given the time period, but allow me to point north to the windy city of Chicago — a place that holds a deep connection, a place Jimmy just visited when he made his return to Wrigley Field. Let’s set the scene…Quiet Knight Bar on West Belmont Avenue in Chicago over four decades ago. This is where Jimmy got his first club success and met up with fellow folk artists like Arlo Guthrie, John Prine and Steve Goodman who were all making a name for themselves on the folk circuit. Around this time Goodman (pictured, right), a die hard Cubs fan, brought Jimmy to his first Cubs game. The two went before a gig and sat in the right field bleachers drinking beer. Jimmy enjoyed himself, thinking it was one of the best ways he could get ready for his own show. The two struck up a kindred friendship with a mutual love for good music and the Cubs. Jimmy would go on to record a few songs written by Steve – This Hotel Room, Door Number 3, and Banana Republics – and then dedicate The Last Mango In Paris album to his late friend after his passing. The 1980s were a renaissance for the Cubs with a strong roster featuring, Ryne Sandberg, Mark Grace, Rick Sutcliffe, Andre Dawson, Shawon Dunston and the man upstairs, Harry Carry. Jimmy would sit with Harry, sing the 7th Inning Stretch and spend some on airtime for the WGN broadcast. In 1984, Steve was scheduled to sing the National Anthem before their first playoff game in 39 years. When Goodman passed away, it was Jimmy Buffett who took the field to sing in his honor. The Cubs won that game 13-0. Over the years Jimmy would have Goodman’s mother, Minnette Goodman, as a guest at his Chicago shows. I recall seeing her backstage laughing with Jimmy, sharing stories about her son a few years before her own passing in 2012. So, to say Jimmy’s return to Wrigley Field this past July was a big deal is an understatement for many reasons. Jimmy’s connection with Chicago resembles Frank Sinatra’s, with stories to support it. 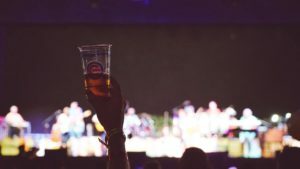 One story in particular, besides all the drinking ones, involves the famous Coral Reefer Band and Buffett Crew softball games. Michael Jordan would watch from the bleachers with a lit cigar. 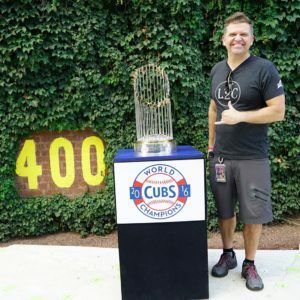 There were spontaneous shows at The Cubby Bear and parties at Le Passage, but Jimmy’s favorite thing was making his annual pilgrimage to Wrigley Field, thanks to his road manager, Mike Mooney. Mooney would conveniently have all the stadium door codes thanks to Jay Blunk (more on Jay in a second) in case Jimmy needed to get around. 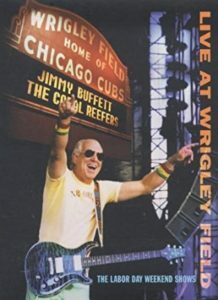 In 2005, Jimmy was the first artist to perform at the famous stadium thanks to Jay Blunk, who, at the time, was the Director of Broadcasting for the Chicago Cubs. Jay is now the Vice President of the Chicago Blackhawks and the reason the Stanley Cup has been on stage with Jimmy three times. Jimmy played back-to-back shows on a sunny Labor Day weekend and a concert DVD was filmed for the occasion. Everyone was a little nervous having never done a show there before, including the Cubs brass and JB. 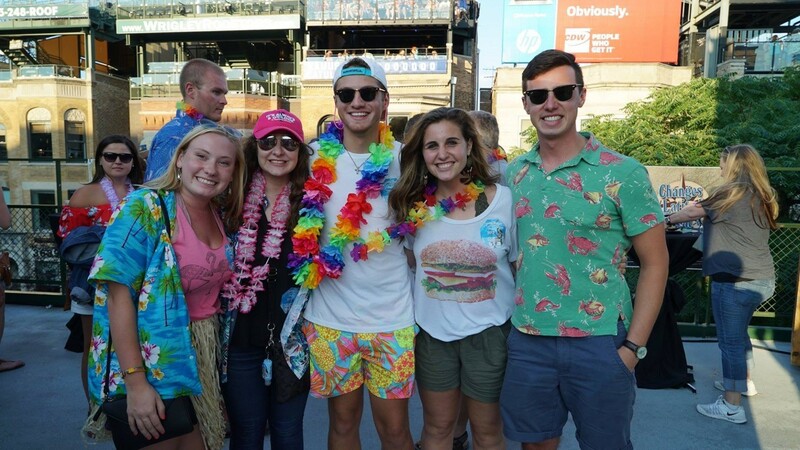 The concerts went off without a hitch, the weather was perfect and Wrigleyville took its outdoor bar moniker to a new level as it morphed into a Margaritaville that engulfed the historic blocks. The only tension that weekend came from news about a hurricane named Katrina hitting the city of New Orleans. To end the show that night Jimmy, along with Mac McAnally, performed Steve Goodman’s City of New Orleans, in the very seats Jimmy had watched his first Cubs game. However, he did leave an open clause in a verbal contract during the inaugural concert when he proclaimed on stage that he would indeed come back to Wrigley when the Cubs won the World Series. You can guess where it goes from here. The day before the show during sound check, Jimmy rehearsed with his tour’s video producer, Stan Kellam, an opening for the show that would be different from the current one. Jimmy wanted to show highlights of the Cubs winning season on the big screen while Steve Goodman’s song, Go Cubs Go, played on the sound system. Halfway through the song Jimmy and the Coral Reefer Band would kick in and play the song from there. 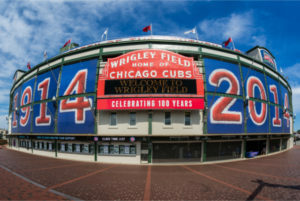 The video clips would not only feature the Cubs, but also monuments in Chicago, including Sluggers bar in Wrigleyville. Sluggers was the meeting place for Jimmy and his crew before and after Cubs games. In fact, it was in Sluggers that Jimmy had a conversation with Blunk and Mooney over drinks about playing Wrigley Field one day. 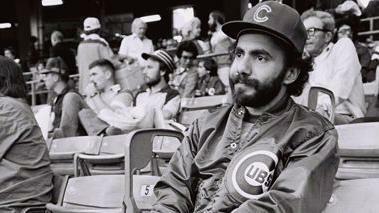 (Fun fact – Jay was instrumental in playing Steve Goodman’s Go Cubs Go after Cubs games as it is today. Can you believe at one point the Cubs were thinking about using Van Halen’s Jump?). Fast forward back to show day and we’re going live with The Bing and Bong Show. We had special guests, Rick Sutcliffe and Ryne Sandberg on the show with the World Series trophy. Preproduction had some things written, including viewer mail, but if you watch the show you’ll see it goes off the rails quickly as it turns into a Springsteen’s Glory Days reunion. I left the show to check on the production office and I found Jay Blunk wandering the halls looking for a bathroom. I grabbed him by the arm and said, “You have to see this.” I threw him into view of Mooney (Executive Producer of The Bing and Bong Show) and he shoved him in front of the cameras. Jimmy, Utley, Sutcliffe and Sandberg light up and start razzing Jay just like they did when Blunk was an intern starting out with the Cubs. The concert starts and the stadium goes crazy as they watch the recap of the Cubs winning the World Series on the video wall. To make things even more exciting, Jimmy has Ryne Sandberg and Rick Sutcliff walk the trophy out on stage during Changes In Latitudes. It launches the concert into orbit and I don’t think Jimmy’s feet touched the ground for the rest of the show. It was the best show of the year, and I hope we won’t have to wait another 12 years for Jimmy to turn Wrigleyville into Margaritaville again. 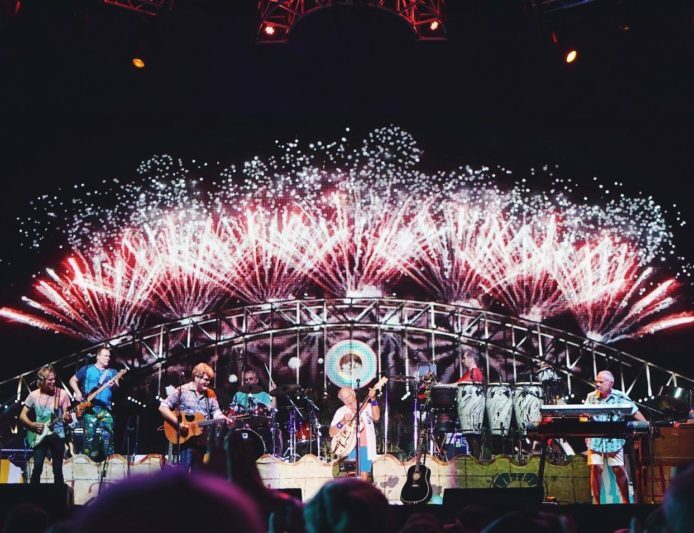 If you missed the show, or just want to relive the magic of Wrigley(rita)ville, subscribe to the Margaritaville You Tube page for more concert clips and show recaps, behind the scenes interviews and daily escapes. Author Heikki Larsen (pictured above with the World Series trophy!) is the Production Coordinator for the Jimmy Buffett Tour and the producer of the Margaritaville Podcast.